A man surfs an online dating site. The US government consumer protection agency warned Americans on Tuesday to be on the lookout for online dating scams. 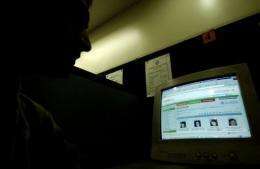 The US government consumer protection agency warned Americans on Tuesday to be on the lookout for online dating scams. "Scammers sometimes use online dating and social networking sites to try to convince people to send money in the name of love," the Federal Trade Commission said. "In a typical scenario, the scam artist creates a fake profile, gains the trust of an online love interest, and then asks that person to wire money -- usually to a location outside the United States," the FTC said. Wiring money is the same as sending cash, it said, and "once it's gone, it can't be recovered." The FTC listed a number of "warning signs" people should be aware of when cruising the online dating scene including love interests who seek to "leave the dating site immediately and use personal e-mail or IM accounts." Online daters should also be aware of potential partners who are "planning to visit, but (are) unable to do so because of a tragic event" or are "claiming instant feelings of love." "Asking for money to pay for travel, visas or other travel documents, medication, a child or other relative's hospital bills" are other warning signs, the FTC said.